ELLEN THOMAS is a seasoned, award-winning British journalist embedded with British troops in Afghanistan; Jalil had been her ‘turp’ (interpreter). They were friends. He had saved her life, yet she refused to give him a loan that would have allowed him to study engineering in the United States. After he is killed she is remorseful and feels indirectly responsible, and takes it upon herself to find out how he died. Messy is the word, and Ellen begins to question Mack’s authority. Her investigation becomes entwined with the life of Hasina, an Afghan woman being looked after in the British camp hospital. Hers was the bombed house where the three dead children – not hers – were found. The subplot involving her is McGivering’s attempt, fitfully successful, to give us an Afghan’s point of view. Hasina’s beloved son is a naïve, would-be suicide bomber; her husband a simple farmer in a land where simple farming is no longer viable; her brother-in-law a thuggish petty potentate who enriches himself while encouraging the glorious martyrdom of others, Hasina’s son included. McGivering, like Ellen, is a veteran British journalist; like Ellen she has covered Afghanistan and been embedded with British troops there. In her acknowledgements she writes: ‘Any negative portrayals are entirely fictional.’ But are they? Ellen’s dilemma is that she suspects but cannot prove that Major Mack has been using aid money to buy support from corrupt local bigwigs like Hasina’s brother-in-law, and to pay them to organize suicide bombings which can be blamed on the Taliban so that terrified locals will welcome foreign forces as defenders and liberators. She learns that Jalil had found out about this, and connects it with his death. Ellen confronts Mack, who immediately crumples. The best this highly intelligent, battle-hardened officer can do is sputter, ‘Nonsense.’ His woodenness convinces Ellen she’s right, but with no hard proof her editor won’t buy the story. Should we? Had McGivering perhaps been in a similar predicament? Is this ‘entirely fictional’ presentation her way of serving the truth? No reader who follows the news from Afghanistan will be shocked by allegations that the West, righteous in its good intentions, blunders into evil. But McGivering’s account of it is unconvincing: Ellen unearths no proof and expects her editor, as the author apparently expects us, to take her suspicions for facts. 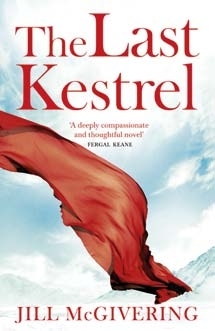 The Last Kestrel is published by Blue Door.